This shows you how to do the job on a 1988 3.0L V6 engine, so I'm not sure if this info applies to other motors. But it should be very similar. First thing you need to do is remove the 4 bolts holding the radiator shroud to the radiator. There are 2 on each side holding it on. Now, the shroud will not come off, but you should pull it forward so that you can slip the belts in between the radiator and the fan. Otherwise you would have to remove the fan from the engine bay. Much easier to do it this way. 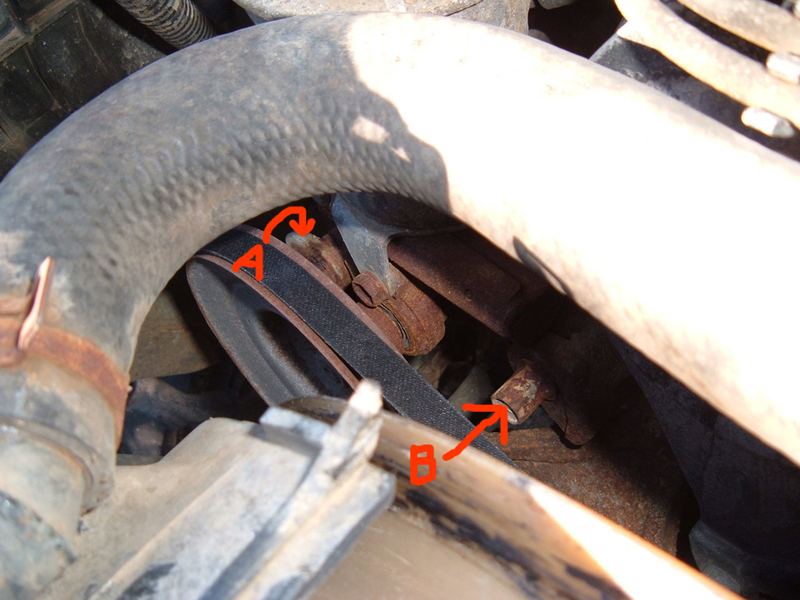 First belt you want to remove is the alternator belt. To do so, you need to loosen 2 bolts, as pictured below. This will allow the alternator to swivel down enough to let you slip the belt off. After you have it free, easiest way is to just cut it in half and remove it. If you are looking to keep it as a spare, let it hang until you remove the A/C belt and you can then snake it back over the fan and remove it without cutting it in half. Next you want to remove the fan and A/C belt. To do so, you need to remove one nut and loosen one bolt. 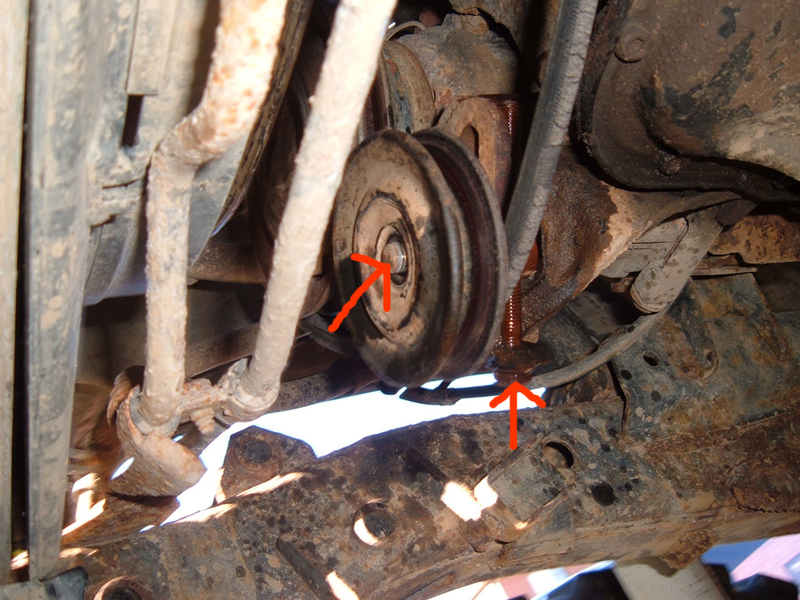 Pictured below, you will see the nut on the pulley that needs to be removed (which isn't pictured since I had removed it prior to taking the picture) and the long bolt that needs to be loosened. This is where I ran into trouble. The nut on the pulley came off very easily, but the long bolt on the tensioner was very rusty and froze in place. What I should have done was soak it in PB blaster or a similar penetrant, but it slipped my mind. I just tried to turn it dry. When I realized it was hard to turn, I hit it with some PB blaster, but didn't let it sit for very long. I ended up breaking off the head of the bolt. Luckily I was still able to get it back together. What I did was heat it with a propane torch to get the broken bolt out of the tensioner, and then found a nut and washer in the garage that fit the bolt, which now acts as a stud. I threaded it into the tensioner and tightened the bolt until the belt was tight. I'll keep an eye out on it but I think it will work. Besides, it's just the A/C belt, so it's not critical if it were to fail. Anyways, once you have that belt free, you can either cut it in half and pull it out, or fish it over the fan and out in one piece. Last belt to remove is the fan and power steering belt. To do so, you need to loosen 2 bolts like you did on the alternator belt. Pictured below are the 2 bolts. Bolt "A" is not actually pictured as it is on the other side of the slotted bracket. You will see it down below. 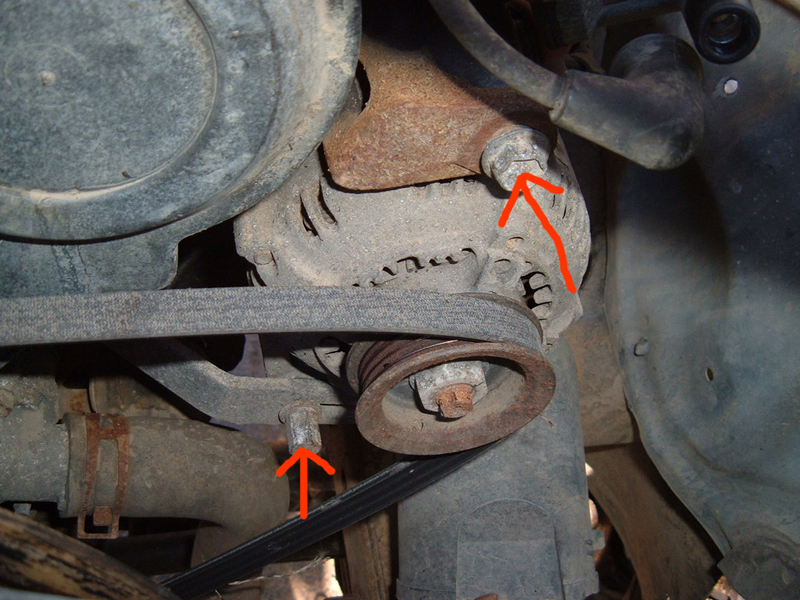 This will allow the power steering pump to swivel down enough to let you free the belt. Again, you can either cut the belt in half or fish it out behind the fan to get it out in one piece. Installation is pretty much the reverse of removal. I used a pry bar to pry the alternator and power steering pump to get the belts tight. Remember to put the a/c pulley tensioner on the way it came off. It would have only taken me a very short time from start to finish, maybe an hour or 2, if I had not broken anything in the process. Take your time and soak the tensioner bolt in PB blaster overnight or have a propane tank on hand just in case (can be bought at Wal-Mart for $20). I've heard of people saying the dealer wanted $250 to install new belts. You can fix it yourself in a hour or 2 for only $25!